It’s easy for us to get into the nitty gritty of asphalt maintenance and repair here at Seal Pro’s Hawaii — after all, welive for smooth pavement. Well this month’s blog posts takes it back to the country’s very first concrete structures and how those initial structures paved (pun intended) the way for concrete today. One of America’s first uses of concrete includes an 1835 construction of a Greek revival house in New York. Other early American concrete structures took place in the mid-1850’s and encompassed barns and houses, some of which still stand today. Concrete is a mixture of sand and stone in a foundation of cement and was first manufactured and patented by English bricklayer, Joseph Aspdin. Aspdin named his concoction “Portland cement” after seeing a resemblance to a specific stone on the Isle of Portland, England. Even before the automobile was invented, American innovators were thinking about ways to pave city streets. In the late 1880’s, a former hardware-store owner and pharmacist, George Bartholomew, of Bellefontaine, Ohio began exploring limestone and clay in his neighborhood mud deposits. While Portland cement had already been available in Europe, very few Americans were able to match its quality. Confident in his discoveries and his improvements for domestic cement-making, George Bartholomew purchased his local marl deposits and established the Buckeye Portland Cement Company. 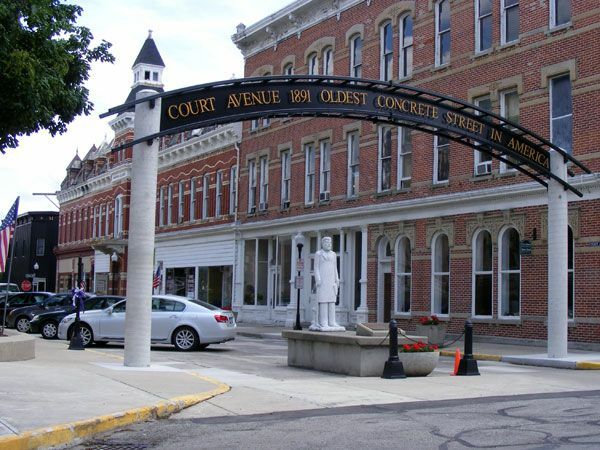 In 1891, Bartholomew convinced local officials to let him pave an eight-foot-wide strip of Main Street with his personal mixture of stone, sand and cement. By 1893, officials agreed to let the self proclaimed cement-maker pave the entire block. That same block of Court Avenue remains the oldest concrete street in America. A portion of Bartholomew’s pavement was given a top achievement in engineering technology in 1893. Modern tests later validated those achievements. Bellefontaine’s concrete, which trapped thousands of small air bubbles within, measured a breaking strength of 8,000 pounds per square inch, an amount much stronger than most concrete used today. We hope this history lesson gets you pumped about pavement. Here at Seal Pro’s we’re constantly looking for ways to improve our technique and effectiveness. What better way to stay sharp in all things pavement-related than to know the history of our industry and follow the path of innovation! We’re Hawaii’s leading commercial and residential asphalt specialists for a reason — contact us today.